AMMONNEWS - Around 1,000 Syrians who sought refuge in Jordan have been returning home each month since July when a cease-fire for southern Syria took force, the U.N. said yesterday. Since then "the number of Syrians returning to the country voluntarily has increased," Mohammed al-Hiwari, spokesman for the U.N. refugee agency, UNHCR in Amman, told AFP. "Today that number has risen to around 1,000 [returnee] per month on average," Hiwari added. The cease-fire brokered by Jordan, Russia and the United States for the southern Syrian provinces of Daraa, Quneitra and Suweida has largely held since it came into force on July 9. 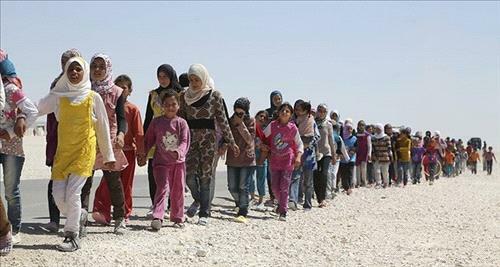 Hosting the refugees has placed a heavy burden on Jordan, a country lacking natural resources. According to Hiwari, the number of refugees who returned voluntarily to Syria rose to 1,203 in August and 1,078 in September. In the six months before the cease-fire, a total of only 1,700 Syrian refugees returned to their home country, he said. Hiwari stressed that the UNHCR "does not encourage the return to zones in Syria that are deemed unsafe." Jordan closed its border with Syria in June 2016 after a Daesh car bomb attack staged near Rukban killed seven Jordanian border guards. Soon after the attack, the army declared Jordan's desert regions that stretch northeast to Syria and east to Iraq "closed military zones." It closed the border with Syria, stranding tens of thousands of refugees fleeing the conflict in their country. Since then, international aid organizations have wrestled with the dilemma posed by sending aid to an off-limits area. The Jordanian army has stopped most humanitarian assistance from getting into the camp since last June. Jordan shares a 375-kilometer (233-mile) border with Syria, which fell into civil war in 2011. The U.N. says Jordan is hosting more than 650,000 Syrian refugees, but authorities in the kingdom put their actual number at 1.3 million. The humanitarian crisis on the Syria-Jordan border escalates as thousands of people trapped on the border are reportedly living only on flour and water, the U.N. warned in August. According to the UNHCR, some 659,000 Syrian refugees and around 63,000 Iraqis have officially registered in Jordan, a country of about 9 million people. U.N. agencies agreed late last year to an aid system that critics say handed much of the control over aid distribution to Jordan's military and a Jordanian contractor and also involved armed men on the Syrian side. The Syrian regime has recently managed to regain control of some 30 kilometers of its border with Jordan with the massive aid of Iran-backed Shiite militias. Jordanian authorities stated their concern over Iran's expanding influence in Syria. Iran denies having any boots on the ground in Syria, and insists its commanders and generals of the elite Revolutionary Guards' foreign operations wing act as "military advisers" both there and in Iraq. The ceasefire brokered in the three southern Syrian provinces is part of a broader Russian-backed plan to create four "de-escalation zones" in rebel-held parts of the country. Russia and Iran, main allies of the Assad regime, and opposition-backer Turkey agreed in May to create the four zones in a deal aimed at bringing about a lasting truce.